Who’s ready for the holidays? Not this girl. There are only 20 days until Christmas (yikes!) and that means family and friends will be descending upon us soon, so why not whip up an easy and delicious meal? Ya’ll know I love me some one-pan meals, so this one totally fits the bill (just like my Lox Frittata). I happened to be reading through old posts (super late into the night) and can’t believe I never got around to giving this recipe its very own post. I discovered it on the back of the bacon package, and since finding it, I’ve learned to turn my food packages around to capitalize on yummy recipes. 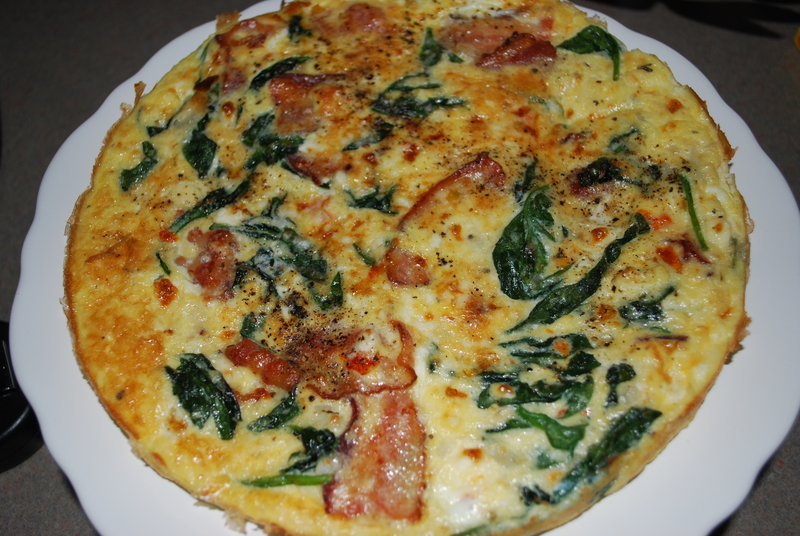 You can’t go wrong with bacon and when you throw some spinach and feta cheese into the mix, you have nice win-win. 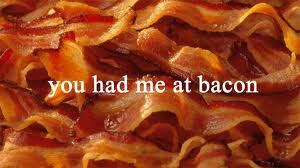 Check out my Valentine’s post with all the bacon. Even though this recipe does call for cheese, I think you could either leave out the cheese, and just add some chopped dried tomatoes and diced basil, or sub in your favorite dairy-free cheese. If you have a large crowd to feed, go ahead and make two. This recipe is so yummy that you might not have leftovers! 1. Place oven rack in center of oven; heat broiler. Cook bacon in 10-inch ovenproof nonstick skillet over medium-high heat until done but not crisp. Remove bacon from skillet and drain on paper towels. 2. Whisk together eggs and garlic; stir in cheese. Set aside. 3. Stir-fry spinach, mushrooms and onion in bacon grease remaining in skillet over medium heat until spinach begins to wilt. Stir in bacon, egg and cheese mixture until evenly combined. Cook until eggs are done on the bottom. 4. Place skillet on center rack in oven. Broil until eggs are set and just begin to brown around the edges of pan, about 3 minutes. 5. Enjoy and try not to hog (haha) it all! Are you all ready for the holidays or are you like me in that you haven’t even started? Apparently, I just like to cook and not worry about the rest of things that ‘need’ to be done. It’s all good, let’s just decide to keep our butts in the kitchen and take care of the ones who have already finished shopping and wrapping (I’m talking to you, you overachievers!). That looks epic! Great job! I am most definitely not ready for the holidays. I haven’t actually got anyone a present yet. Might need to work on that!